We are actively engaged in offering our clients a wide range of SS Slat Conveyor. 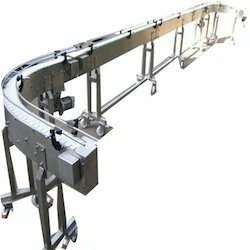 These conveyors are used in heavy engineering industries for transportation of materials with uttermost perfection. Moreover, these conveyors have wide uses in automobile industries for assembly of vehicles owing to their fabrication with high-grade stainless steel. 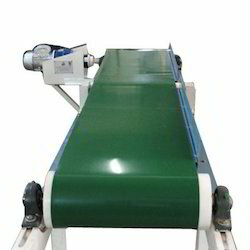 We have with us wide stipulation of these conveyors for supply to customers as per their demands. Load to travel As per requirement. Being a quality centric organization, we are dedicated to offering our clients a vast array of Inclined Conveyer. The conveyor belt is adaptable for stationary and mobile crushing plants, Conveyor belt is widely used in mining, metallurgical and coal industry to transfer sandy or lump material, or packaged material. The transfer system can be one single or multi-conveyer or combined with other transfer equipment according to various transferring requirements. It can be installed horizontally to meet the needs of different transfer lines. Materials are discharged after being sent to the bend pulley by the adhesive tape to achieve the purpose of sending a variety of materials. Looking for Industrial Conveyers ?